DID YOU KNOW OUR OPTOMETRISTS CAN PROVIDE YOU WITH A MEDICAL EYE EXAM? Optometry training covers the entire spectrum of eye care. Optometrists are trained to do thorough eye exams, prescribe glasses or contact lenses, offer medical treatment for several eye problems, and participate in pre- and post-operative care for eye surgeries such as Lasik and cataract surgery performed by an ophthalmologist. Cornea and External Disease: Diagnosing and treating diseases related to the cornea, sclera and eyelids such as corneal ulcers, conjunctivitis, hordeolum/stye, blepharitis, dry eye syndrome and more. Cataracts: A Cataract is the clouding of the lens inside the eye, similar to a window that is fogged with steam. When the lens becomes cloudy, light rays cannot pass through it easily and vision is blurry. After the formation of a cataract, normal activities such as reading, golfing, gardening or driving can become difficult. About 26.5 million Americans age 40 and older have cataracts. Cataracts are the leading cause of blindness worldwide. Cataract surgery is one of the most frequently performed procedures in the United States. Cataract surgery can be done traditionally using ultrasound energy to remove the cloudy lens or it can be removed with laser-assisted technology. During surgery, a small incision is made to remove the cloudy lens and replace it with a clear lens, called an implant or intraocular lens (IOL). The IOL is a permanent focusing device that requires no care by the patient and provides excellent vision for millions of people each year. Remember, cataracts are detected through a comprehensive eye examination which should be performed annually. Glaucoma: Diagnosing, managing and providing treatment of glaucoma and other age-related vision disorders that can create optic nerve damage due to increased ocular pressure. Diabetic Retinopathy: If you have diabetes it's important that you have a yearly dilated eye exam in order to determine if your diabetes is affecting the back of your eyes, the retina. Our doctors are able to diagnose and manage diabetic retinopathy and, when necessary, refer to a retinal specialist for treatment. 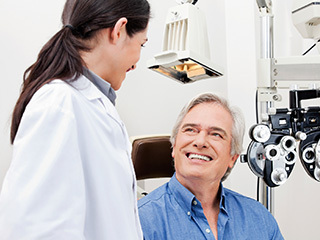 In addition, your optometrist works with other health professionals, such as primary care physicians and endocrinologists, to provide continuity of patient care for patients who have systemic diabetes. Macular Degeneration: This is a disease that affects the central part of your vision. Our doctors are able to diagnose and manage macular degeneration by examining the back of the eye, the retina, and by running special testing such as an OCT Retinal Scan which shows the health of the different layers of the macula. Our optometrists work with retinal specialists when treatment for macular degeneration is necessary. Pediatric Eye Care: There is more to vision than seeing 20/20. During a pediatric eye exam, your doctor examines the child's binocular vision to determine if the eyes are working together. Our optometrists are able to diagnose strabismus and amblyopia, to provide therapy treatment and, in some cases, refer a patient to a specialist when strabismus surgery is indicated. Eye Emergencies: Red eyes, sudden vision loss, floaters, eye pain, and corneal or conjunctival foreign bodies are a few eye emergency conditions that your optometrist can diagnose and treat. Our doctors are able to diagnose, manage and treat these conditions as well as refer to the correct specialist when necessary.